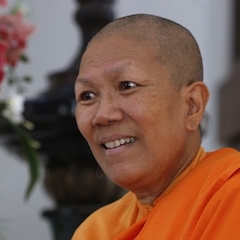 Since I became interested in supporting bhikkhuni ordination, I encountered a series of objections in the form of Vinaya arguments why women could not or should not take full ordination. I investigated most of the important ones, and these investigations ended up as a book, Bhikkhuni Vinaya Studies, which I’ll upload here for your convenience. As with all my books, you can also buy a print on demand copy from Lulu if you like. In the course of investigating these issues, I discovered that most of them had little to no canonical support, and had survived and spread in the Buddhist community despite their non-canonical status. One of these issues was the belief—oft-stated but rarely substantiated—that once a bhikkhuni disrobes she cannot reordain. This is in stark contrast with the monks, for a monk may disrobe and reordain many times. Now, this is a big deal. For a woman to be able to choose her spiritual path is a fundamental human right. If she chooses to leave the robes, she is not doing anything wrong, and not harming anyone. Should she later choose to ordain again, she is also not doing anything wrong. The core purpose of the Vinaya is to support well-intentioned people to practice the Dhamma so that they can realize awakening. Preventing people from ordaining undermines this fundamental purpose and this fundamental human right. It’s only acceptable if there is a good reason. And we would require a strong and clear canonical foundation for this. The Pali Vinaya contains no general prohibition against a bhikkhuni reordaining. It only prohibits this in the special case of a bhikkhuni who goes over to the following of another sect without disrobing first; this is similar to the rule for monks. Various other Vinayas (in Chinese) and later texts do contain a prohibition against a bhikkhuni reordaining. This clearly means that bhikkhunis who are practicing in the Pali tradition are allowed to reordain. For those practicing in other traditions the situation is more complex. Without getting into too much detail, my opinion is that here, as is often the case, the Pali text represents our oldest witness and the closest approximation to the Vinaya as taught by the Buddha. While bhikkhunis may choose to follow the tradition as handed down to them, it is also acceptable to cite this as a justification for allowing reordination. For those bhikkhunis following the Dharmaguptaka tradition of East Asia, there does not seem to be a canonical statement prohibiting reordination. Rather, this idea was adopted from the Sarvāstivāda Vinaya by commentators. So why bring this up now? My friend Ven Jampa Tsedroen recently kindly sent me a copy of an article by the well-known Buddhist academic Petra Kieffer-Pülz. Petra is a distinguished scholar of Buddhism who has published widely on the topic of bhikkhuni Vinaya. You can see a list of her publications here. The relevant article is “Re-ordination of Former Buddhist Nuns in the Theravāda Tradition”, Buddhism, Law & Society, vol. 1 (2015–2016), 1–32. It doesn’t appear to be available online. A recurring theme of her paper is the criticism of my argument in section 4.2 of Bhikkhuni Vinaya Studies. She claims that the prohibition against reordination is found in the Pali Vinaya, at least by way of inference. Nevertheless, while the bulk of her article gives the background to the issue and analyzes the commentaries and subcommentaries in some detail, her argument in support of a canonical basis for the prohibition is confined to a couple of sentences. The passage she cites is one that I had previously discussed. Petra offers little in the way of justification for her interpretation, but I will discuss it further below. To be clear, my thesis is this. In the Pali Vinaya there is no prohibition against a bhikkhuni reordaining. Such prohibitions appear in various other texts. This is, if you like, the weak form of my thesis, and I think it is beyond dispute. But I would also propose a stronger form: that such a prohibition was not made by the Buddha and was not a part of the early Buddhist tradition, but was inserted into later texts by monks, as part of a generally sexist tendency in later Vinaya developments. Some people will disagree with this, but this doesn’t affect the weak thesis. Petra’s thesis is that the Pali Vinaya, in common with the various other texts, includes, albeit by implication, a prohibition against a bhikkhuni reordaining. Thus she argues that the various Vinayas and commentarial literatures under discussion are consistent. Even though her criticism of my basic argument makes up only a small part of her paper, it is critical to this central thesis. Petra’s interpretation is not a required or even plausible reading of the text, as I will show below. But the specific textual argument here is really beside the point. Even if it was correct, it wouldn’t bear the weight that Petra places on it. The passage in question is an entirely separate rule, which doesn’t even discuss the question of reordination. This is why in my original essay, the discussion of this was confined to part of a footnote (Chapter 4, note 19). That’s where it belongs; it’s an aside, not a fundamental principle that can determine the spiritual fate of thousands of women. There is a constant temptation to overinterpret ancient texts, to read as much meaning as possible into each statement. On this forum, I have repeatedly advocated for the principle of least meaning; that is, we should read each context as simply as possible, interpreting it as little as possible, and staying close to plain, literal meanings. But Petra’s argument is the very opposite of this. Rather than simply accepting the passages that consider disrobing and reordaining, she re-interprets them, burdening them with an excess of meaning derived from an unrelated context. In doing so, women are deprived of a fundamental human right, based on the inference of a dubious reading from an unrelated passage. If a nun knows that another nun has committed an offense entailing expulsion, but she neither admonishes her herself nor informs others, and afterwards—whether that nun remains or has died or has been expelled or has converted—she says, ‘Venerables, although I previously knew that this nun was of such-and-such kind, I neither admonished her myself nor did I inform others,ʼ she too is expelled and not in communion. Has been expelled: she has either disrobed herself or been expelled by others. On the face of it, this is a curious explanation. It’s saying that nāsitā means nāsitā plus something else, i.e. A = A + B. This seems like a logical fallacy; actually it’s not, as we shall see. Thus expelled means: so expelled. Not the most helpful explanation, perhaps, but it does make it clear that “expelled” just means expelled and not anything else. First, let’s have a simile. No car may travel faster than 60 kph within town limits. So that’s fine, until the cops bust someone on a motorbike doing 70. What to do? Well, there are essentially two options. Either the matter goes back to the Council, who reframe the bylaw to include motorbikes. Or else a judge looks at it and determines that, for reasons of precedent or common sense, motorbikes were implied in the original bylaw. Now, in the Vinaya, we find both of these methods used frequently. There are many instances where subsequent actions of monks or nuns prompt the Buddha to reformulate a rule. But at a certain point this process stopped (most likely when the Buddha died). Subsequent interpretations and expansions of the rules were added in the layers of explanation on the original text, like a judge who interprets the bylaw in an inclusive way, thus establishing precedent. For the Vinaya texts, the oldest layer of explanation is included in the canon itself. This is the so-called Vibhaṅga, which is an abhivinaya text, similar in form to and developed alongside the canonical abhidhamma texts. The Vibhanga is universally agreed to be later than the patimokkha rules on which it is based; I would ascribe it generally to the period around 100–200 years after the Buddha. The purpose of such explanations is to clarify and help in understanding and applying the basic rule. They are not meant to supersede or change the old rule. Nevertheless, it does happen that the explanations do introduce changes, whether accidentally or intentionally. In such cases, it becomes a matter of interpretation. As one would expect, the basic patimokkha rules are very similar in the different recensions of the Vinaya, while the Vibhangas vary considerably. However, at a certain point, the Vibhangas too became closed, and subsequent interpretation and elaboration was developed in the various commentaries, which themselves attracted subcommentaries, and so on. Eventually, we end up with internet forums! What we’re doing here is, in fact, a direct continuation of this same tradition. It is an elementary principle of critical text studies that we do not assume that all these variations and layers say exactly the same thing. Rather, it is inevitable that changes and variations will occur, as the texts reflect the specific authors and their times. But amid all this complexity, we should not lose sight of the basic principle. The purpose of the commentaries is to explain the text. If the meaning of the text is clear, there is no need for commentaries. This is relevant in our context, for the text on the disrobal of a bhikkhuni includes nothing that prohibits her from reordaining. This is clear and final. There is nothing that requires additional interpretation, so no commentary affects this. It should now be clear what is happening in Bhikkhuni Parajika 6. When the rule was first laid down, various cases were considered: a nun who is still ordained, one who has died, one who has been expelled, and one who has converted to another religion. For whatever reason, the case of a nun who had disrobed is not mentioned. There is nothing unusual about this. The Vinaya is an ancient legal text, one that was compiled gradually on a case by case basis. It is full of little irregularities like this. And this, of course, is one of the main reasons why the layers of explanation became necessary. So at a certain point, the question came up: how does this rule apply in the case of a nun who has disrobed? And the redactors of the Pali canon—i.e. the Vinaya expert monks living a century or so after the Buddha—decided that the best course was to include a disrobed nun under the same category as an expelled nun for the purposes of this rule. This seems reasonable enough, but I haven’t really looked into this point. Anyway, we should be clear that this is meant to apply to this context, and is not a blanket definition. Admittedly, we frequently have to infer the meanings of terms in the Vinaya from one context to another. But this must be done with due sensitivity to the context. There is a clear and specific reason why the definition was expanded in Bhikkhuni Parajika 6, and the expanded explanation should not be transferred unless there is a similar context that requires it. The word-for-word commentary (padabhājanīya), which comments upon each single word of the rule, explains nāsitā, “excluded,” by either “one who herself left informally” (sayaṁ vibbhantā hoti) or one “excluded by others” (aññehi nāsitā). Although this does not imply that nāsitā and vibbhantā are synonyms, it is obvious that the authors of the word-for-word commentary equated a nun who informally left the community with one who was excluded by members of the Buddhist community. In a footnote and in the conclusion she repeats the claim that the terms are “equated” but doesn’t provide any further argumentation. Her entire thesis rests on her assertion that this is “obvious”. But far from being obvious, it’s simply not the case. The two notions of “disrobed” and “expelled” are both included under the umbrella category of “expelled”. But they clearly have different meanings and neither here nor anywhere else are they equated. “Silver” means a dollar, a copper coin, a wooden coin, a lac coin, or whatever is used as currency. Obviously this doesn’t mean that copper and wood are really silver, or that these things are identical with each other. It just means that in the context of this rule “silver” is used as a blanket term for the various forms of currency. This kind of thing happens in almost every Vinaya rule. It is somewhat unusual to find the defined term of a rule repeated in the definition alongside a different term (i.e. A = A + B). But this is easy to understand once the history of the text is taken into account, as above. “Such mind-thought” means: what is thought, that is mind; what is mind, that is thought. There is no such statement of equivalence in Bhikkhuni Parajika 6. Indeed, the phrase uses the disjunctive vā (“or”), clearly distinguishing the two parts of the explanation. The Pali Vinaya does not prohibit a bhikkhuni from reordaining. It does not do so explicitly, nor does it do so by implication. Despite the wealth of erudition displayed throughout her article, Petra’s thesis rests on a false assertion. It’s been a long time since I wrote my book on Bhikkhuni Vinaya Studies, and I would not be surprised to find mistakes or things I’d express or interpret differently. Still, I think it holds up pretty well. If I may, I’d like to share a little reflection of the process I was going through at the time and how my attitudes developed. This book stems from a period where I was questing and learning, trying to come to grips with the fact that my tradition, the spiritual path to which I had dedicated my life to, contained things that I found abhorrent. I could see the pain of this not just in my own struggle, but even more acutely in the many women who I saw trying to devote themselves to the Buddhist path. I had become painfully aware of the sexist attitudes of many of my fellow monks, and how such attitudes, even if not present when they ordained, were nurtured and grown in a male-only patriarchy. I saw first hand how men who I thought to be decent and compassionate shut down and became blind to the suffering of others when it conflicted with their perceived self interest. And when I looked into the ancient texts, I saw the same patterns recurring there. Against myself, against my every wish and belief, I was gradually forced to conclude that toxic, irrational forces of sexism had corrupted the Buddhist tradition in many ways. This, of course, would come as no surprise to anyone who had done a secular study of the history of patriarchies. It happens everywhere; the historical problem is not whether it happens, but how and why, the details and particulars. I found, to my dismay, that many monks simply dismissed any research or arguments made by myself or by others. They didn’t respond to them or refute them, they just ignored them. I learned a hard fact of life: when you have power and wealth and property and prestige, facts become optional. This is why my research into the history of bhikkhunis gradually became a research into mythology. I realized that the irrational forces driving the fear of women were expressed, not in legal texts—which are just the symptom—but in the stories that are told and retold about women’s power, their bodies, their freedom. This became the subject of my subsequent book, White Bones Red Rot Black Snakes. I came to accept that without an understanding of these irrational forces, we will inevitably distort how they play out in supposedly rational contexts such as Vinaya. That sexist attitudes inform Buddhist texts and Buddhist culture is not in question. To ignore this is to live in denial. I know what that denial is; I used to live there. I know those arguments against women from the inside, for they used to be my arguments. But I was wrong and I changed. Calling sexism out for what it is is not bias. Sexism is bias against women. Calling it “sexism” is being clear-headed and compassionate. It’s not based on an assumption, it’s based on painful learned experience that has been deeply and repeatedly scrutinized. If we are to develop an understanding of our tradition that includes all, good and bad, then we must stop being afraid, we must take our tradition off its pedestal, and we must start to understand the ways our traditions have been influenced by the same ordinary weaknesses and biases that we encounter in every aspect of life and culture. And most importantly, we must own our own beliefs and values. The texts don’t exist in some Platonic realm of absolute truth. In my very first book, A Swift Pair of Messengers, I said that meaning doesn’t inhere in a text, but arises in the relation between a text and its reader. This is even more true for me today than it was then. We don’t just deal with facts, we deal with values. These are not in opposition: deeply held beliefs and strong clear values drive the search for genuine and meaningful truth. And I hope that in this little study I have given an example of how this is possible. Do you see this rule in anyway related to Bhikkhuni Mettiyā mentioned in the origin story of Bhikhu Sanghadisesa #8? There she was expelled (nāsetha) of course after accusing Dabba the arahant of committing a parajika in search of favour from some crazy dodgy monks (Mettiya and Bhummaja). Yes, it’s the same or a similar case. I haven’t studied the Vinaya in detail for some time, so I’m kinda hazy on many of these details, but it strikes me as odd that she’s expelled by the monks, rather than the nuns; then after she’s expelled she’s still referred to as a bhikkhuni, so I’m not sure where she’s expelled from: from the nuns’ monastery? The bad monks plead on her behalf—which, okay, they did a lot of bad stuff, but give them credit for this—but we don’t hear what happened to her afterwards. Perhaps these points are explained elsewhere, or perhaps it’s the wonkiness that we find in the background stories sometimes. Thanks, Bhante, this is really good. Your passion shines through and the argument is powerful. I would like to add a couple of minor things of a more technical nature, which hopefully will strengthen the argument further. The case of the nun who goes over to another sect and then returns to seek re-ordination, that you mention in passing, has further aspects to it that relate to the present discussion. As you mention, it is specifically said that she cannot re-ordain. This stands in direct contract to the immediately following case where she disrobes (vibbhamati), where no such ruling on re-ordination is found. In other words, here we have two statements in the Pali, one following immediately after the other. One says she cannot re-ordain, the other says no such thing. The implication is that a nun who disrobes can re-ordain. (This is found at the end of the bhikkhunī-khandhaka). In the light of the fact that the commentator is usually more lenient, even when the canonical text does prescribe a specific treatment, this is highly unusual, and it is to be assumed that there is a specific reason for this decisive statement. Really? Maybe sometimes, but there are many instances of the commentaries being stricter than the canonical vinaya. It is well known that the commentaries call all sorts of things dukkata (implying an offence), where the Canon says no such thing. This sort of statement needs to be backed by careful research, otherwise it is useless. Although this does not imply that nāsita and vibbhanta are synonyms, it is obvious that the authors of the word-for-word commentary equated a nun who informally left the community with one who was excluded by members of the Buddhist community. One problem with this is that word-analysis defines nāsita (expelled), not vibbhanta (disrobed). If vibbhanta was defined as nāsita, she might have had a stronger case. In other words, nāsita gets its meaning form vibbhanta, not the other way around. And nāsita happens to be quite a flexible word, which certainly is not synonymous with pārājika. E.g. at bhikkhu pācittiya 70 a novice is nāsita-ed. This can obviously not refer to pārājika, and it seems the novice can be reinstated and even receive upasampadā, at least in some cases. In other context, too, such as AN 4.243 nāsita has a broad meaning that includes temporary expulsion of a monk. Given the flexibility of the word, it seems likely to me that in the present case vibbhanta retains its ordinary canonical meaning (“departs from the monastic life”) and that nāsita has a slightly broader scope than it usually has. I just wanted to say a quick thank you to you both Bhante @sujato and @brahmali and of course Ajahn Brahm and the Bodhinyana sangha for all your efforts in progressing these discussions. I dont know where we’d be without you all, but I do know how lucky I am to be looking to ordain at Dhammasara! I am very lucky to be a member of the Sutta central. As English my second language I can not comment anything but I enjoy a lot as mental food. With 4 fold Buddhist will balance to run the Sasana. May all beings be happy and peaceful mind.